Blog Archive - Page 3 of 9 - Stratawest Management Ltd.
Our friends at Lesperance Mendes recently published an article summarizing a court case that has implications for the many Strata Corporations that are trying to eliminate short-term rentals (licenses to occupy) in Residential Strata Lots. Most of our City of Vancouver clients will be surprised to see a new “STREET CLEANING” fee appear on their annual utility bill. The cost is $19 per Residential Strata Lot. There was no formal announcement about this new fee, it simply appeared on the annual utility bill. For some of our clients, this will represent a rather significant expenditure- reaching into the thousands of dollars for units of 50+. We received no advance notice of the new fee, nor did any Strata Corporations to our knowledge. In other words, there was no opportunity to budget for it, so unfortunately the extra cost will simply have to be absorbed into existing operating budgets and included in future ones. Upon receiving the first of these invoices, we reached out to the City to express our concerns. Below is their response and explanation on the new fee (note the absence of an apology/explanation for why it wasn’t announced in advance). Also included is contact information for the City, for those interested in expressing feedback/dissatisfaction with the new fee or any other matter. Thank you for contacting the City of Vancouver. In an effort to reduce illegal dumping and create cleaner and safer public spaces, Council has approved investments in public realm cleanliness. These investments will be partially funded by a new Street Cleaning Utility fee which begins in 2017. Under Council’s direction, savings from the recycling transition to Multi-Material BC have been redirected to provide all residents with additional street cleaning services, with added support in high demand neighbourhoods where illegal dumping and cleanliness continue to be an issue. The Street Cleaning Utility fee is a cost effective option for the City to efficiently manage and reduce waste over the long term. -300 new litter receptacles added to hot spot and high-demand areas city-wide; -Added focus on litter and needle collection close to schools and residential areas (such as Strathcona, Kensington/Cedar Cottage and Grandview Woodland); -New recycling and waste diversion programs added to public spaces; -Increased enforcement through ticketing to address illegal dumping. We are open to take your call from 7:00 am to 10:00 pm, 7 days/week, 365 days/year (including holidays). We also offer interpretation services in over 170 languages. In a follow up to our previous post regarding a Court Order requiring an Owner and his spouse to cease and desist particularly egregious behaviour, the Supreme Court has ordered that they sell their suite and depart within one month. You can read the ruling here. A CBC summary can be read here. Needless to say, the behaviour described in the ruling (which has only gotten worse since the original order) is somewhat unique. While every Strata has it’s outliers, the sorts of actions described in the ruling on the part of the respondents isn’t your typical everyday nuisance resident. That being said, it’s important to be reminded of some of the steps that the Strata took which made the Court’s job relatively straight forward – documenting every complaint, sending letters, offering hearings, obtaining affidavits about the behavior, and probably most importantly, engaging legal counsel to provide advice and make applications to the Courts. When dealing with ongoing cases of nuisance behavior, we encourage all Strata Councils to ensure that the complaints are documented and legal counsel is engaged as soon as it becomes apparent that issuing fines is not going to be a sufficient remedy. From time to time, we have the opportunity to review new Case Law in BC and across Canada through our membership with the Canadian Condominium Institute (CCI http://www.ccivancouver.ca ), and we are also forwarded interesting Decisions from other jurisdictions by our colleagues in the legal world when they believe it will be of interest. This one certainly fits that bill. The BC election is now underway, and our office gets a lot of inquiries about the appropriateness (or inappropriateness) of Owners/Tenants placing election signage on or around their Strata Lots. We have previously published an article about Election Signage which explains that for Federal Elections, there is legislation which over-rides the Strata Property Act and Strata Corporation Bylaws on signage. We’d like to remind our readers that this only applies to Federal Elections. In other words, the Strata’s bylaws on signage prevail when it comes to Provincial (and Municipal) elections. Expenditures from the Contingency Reserve Fund (CRF) are a generally well understood concept, and a Google search will show many articles from our esteemed colleagues in the legal community discussing the many nuances and elements that need to be taken into consideration when authorizing an expenditure from the CRF. In a nutshell, the CRF is for either planned expenses (with Owner authorization) or emergencies (without). 98(1) If a proposed expenditure has not been put forward for approval in the budget or at an annual or special general meeting, the strata corporation may only make the expenditure in accordance with this section. (b) if the bylaws are silent as to the amount, less than $2 000 or 5% of the total contribution to the operating fund for the current year, whichever is less. (3) The expenditure may be made out of the operating fund or contingency reserve fund if there are reasonable grounds to believe that an immediate expenditure is necessary to ensure safety or prevent significant loss or damage, whether physical or otherwise. (4) A bylaw setting out an amount for the purposes of subsection (2) (a) may set out further conditions for, or limitations on, any expenditures under that provision. (5) Any expenditure under subsection (3) must not exceed the minimum amount needed to ensure safety or prevent significant loss or damage. (6) The strata corporation must inform owners as soon as feasible about any expenditure made under subsection (3). What this section of SPA provides for is to allow the Strata Council to authorize an expense up to $2,000 (cumulatively, throughout the entire fiscal year) from the Operating Budget which was not approved as a line-item at the Annual General Meeting by the Owners. This is contingent on sub-section 3 which says that the expenditure needs to be necessary to ensure “safety or prevent significant loss or damage, whether physical or otherwise”. A typical example of this is that many Strata Corporations lack a “Legal” budget (though we encourage you to change that, for reasons we’ll outline below*) especially when they are not planning for any legal expenses. If the Strata Corporation is sued and there is no insurance coverage, or needs to obtain a legal opinion on a pressing matter which could lead to “significant loss”, the Strata Council can spend up to $2,000 without seeking explicit authorization from the Owners in advance. It should be recorded in the minutes, in order to satisfy sub-section 6 and ensure that the Owners are aware of the expense. Interestingly, sub-sections 2 and 4 allow for a Strata Corporation to adopt a Bylaw that gives authorization beyond the $2,000 in SPA. It is also permissible to adopt Bylaws that grant Council more latitude beyond the “safety/significant loss or damage” reasons to make such expenditures. For example, authorization could be granted by way of a Bylaw to allow Council to expend up to $5,000 in the event of legal expenses not otherwise budgeted. Keep in mind that the default amount in SPA hasn’t been updated in 17+ years and, as most Council members will know, costs for just about everything have risen dramatically in that time. Using the example from above, there’s no doubt that obtaining a legal opinion on any matter would be more expensive than it was 17 years ago. Strata Councils should give some thought to implementing a Bylaw that gives them a little more latitude for Unapproved Expenditures, though this may be a bit of a politically uphill battle to fight with Owners who might be hesitant about granting extra authority to the Strata Council. The flip side, though, is that technically any expense beyond that $2,000 threshold made by Council out of the Operating Budget is in violation of the Strata Property Act and a General Meeting would be required to authorize the expenditure especially if sufficient funds were not available in the CRF. This in and of itself is time consuming and costly. *We mentioned above that we’re encouraging our clients to budget more for Legal expenses than they may previously have done. This is because, in general, life in Strata Corporations is becoming more and more litigious every year. With the arrival of the Civil Resolution Tribunal (CRT), all Strata Corporations should expect to require legal advice on a more frequent basis – simply put, the barriers to legal action against Strata Corporations have been greatly reduced and thus more Owners are filing claims through the CRT. While some of these may be straight forward and some potentially even have legal assistance covered by the existing Strata Corporation insurance policy, many will require legal counsel to be hired in order to assist the Strata Council with the proper handling of the claim. Please refer to our previous post on the CRT for more information on that specific topic. We are taking this opportunity to republish one of our more popular articles, originally published October 16, 2014, as we can now include a Chinese language translation of the entire article (including the Handling Uninsured Claims within a Strata Corporation portion provided by Clark Wilson LLP). Chinese language translation of this article can be found here. Strata Corporations often wrestle with the question of who is responsible for repairing a Strata Lot when there is water damage as a result of a leak, drainage backup or other calamity. Included below for your benefit is advice offered by Clark Wilson LLP on the subject, which we hope will provide some guidance. Special thanks to them for offering this advice. With apologies in advance for the many puns from our colleagues at Lesperance Mendes, we thought it would be beneficial to link to two recent articles of theirs regarding marijuana (and smoking in general) within Strata Lots. The first is a link to their excellent commentary on the very first decision published by the Civil Resolution Tribunal. The case revolves around a Strata Corporation seeking relief from an Owner who had been fined repeatedly for smoking in their suite (both marijuana and tobacco). The Strata sought an order to prevent the Owner from continuing to do so and not for any monetary damages- though this is an option that was available to them. The CRT found in favour of the Strata Corporation, though unfortunately it was at least partially because the claim was uncontested. The reasons are laid out in the published judgement itself, but suffice it to say the Tribunal was very critical of the argument put forward by the Owner, his lawyer and his Doctor as to why he felt compelled to consume marijuana by smoking it. They noted in particular that there are other (legal) consumption methods available to anyone with a prescription for marijuana. The Tribunal also quite rightly pointed out that the alleged disability of the Owner had no bearing on their smoking of cigarettes. The second link is a more general, pun filled discussion on medical marijuana, the implication of “grown your own” and the importance of strong bylaws outlining clear expectations of Owners who suffer from medical conditions that require them to ingest marijuana. We should all expect this issue to become much more prevalent within shared communities. Consumption of marijuana is becoming more normalized, and it is expected that in the not so distant future marijuana will be decriminalized and available for recreational consumption. Whether or not this will lead to increased usage is debatable, but it will surely result in more difficulties within Strata Corporation as Owners and Residents advance more and more claims that they should be allowed to “smoke it” if they’ve “got it”. We encourage any Strata Council dealing with a nuisance complaint about marijuana to tread carefully and engage legal advice where appropriate to address the complaints, so as to be sure that fines and other enforcement measures are enfor0ecable in the event of a claim at the Civil Resolution Tribunal. With continued incredible support from our staff and industry colleagues alike, Stratawest is proud to have made significant contributions to the North Shore Christmas Bureau for the 7th year running and to Harvest Project in our second year of involvement with their fantastic program – extending a hand up, not just a hand out. The response this year was again awe-inspiring, with amazingly generous donations of toys, clothing, thousands of dollars in gift cards, movie passes, and restaurant meals, sporting equipment – including 12 NEW bikes! – and sporting event tickets, iPods and many other items for needy families. Incredibly, there was far more than the picture shows as we had to make a number of trips over the past couple of weeks. We were also inspired to take part in Harvest Project’s Adopt A Family campaign to bring hope to North Shore families in need and on their way back to healthier lives. 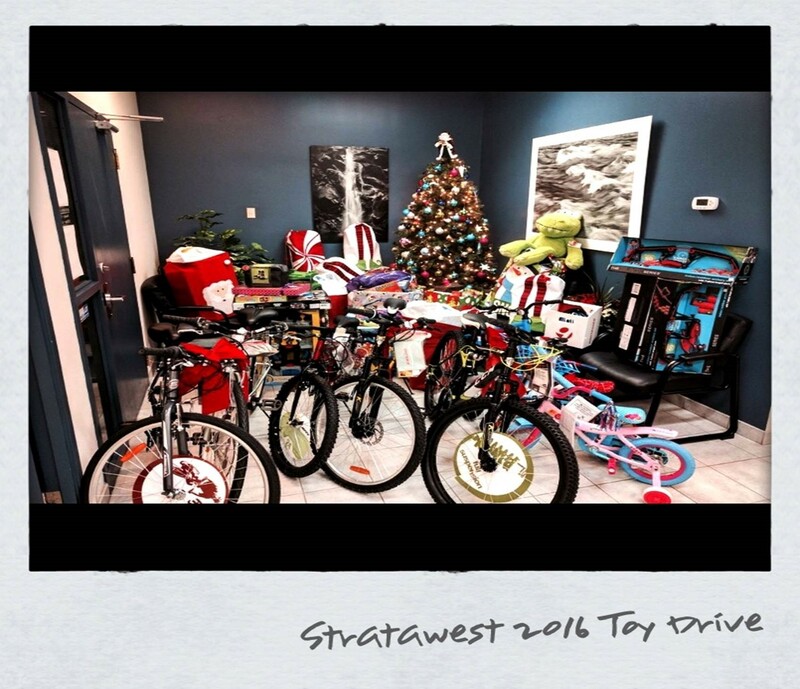 The staff and leadership of Stratawest believe it’s important to ‘give where we live’. Harvest Project is a local charity that supports over 350 families each month with coaching and counsel along with grocery and clothing support. On our goal of $2,400, we are thrilled to have raised (so far) over $3,100 which will help support a family for the coming year. Amazing! We want to sincerely thank and acknowledge the support of our colleagues in the industry and our staff for making this holiday season a better one for so many kids and their families. It is because of the participation and big hearts of many that we are collectively able to make a difference in so many lives, so thank you so much to those that took part and to the many others holding events of their own this holiday season. Season’s Greetings to all of you, and best wishes from all of us here at Stratawest Management. Cheers! P.S Shout out to James Wilson at Obsession Bikes and their 2017 Bikes for Tykes program in benefit of the North Shore Christmas Bureau for again handling delivery duties of the donated bikes. Merry Christmas guys! On November 15th, Stratawest was pleased to welcome a large number of our interested council members to a client seminar entitled, “A Discussion on the Civil Resolution Tribunal”. Joining us to provide an overview of the Civil Resolution Tribunal (CRT) were Shannon Salter, Chair of the CRT, and Tony Gioventu, Executive Director of the Condominium Home Owners Association (CHOA). We are extremely thankful to both Shannon and Tony for taking time from their very busy schedules to speak with us and also for agreeing to provide the following information to our clients and all of those that follow our blog. © 2019 Stratawest Management Ltd. All rights reserved.